This page is now for the links to the stories behind the cartoons, which I will add month by month. 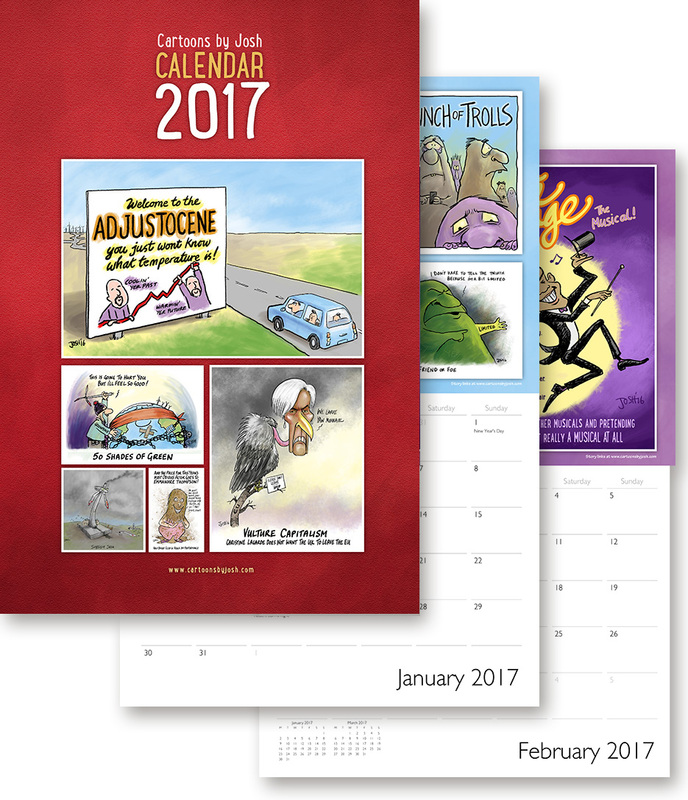 You can still order the Cartoons by Josh Calendar – see below. We start the year with ‘Welcome to the Adjustocene’ – one of the many problems with Climate science is the constant adjusting of the data. There may be good reasons for doing so but it does mean that you can never trust temperature data because it will probably be adjusted at some point in the future. To the right is a cartoon of a bunch of trolls – I drew this to post on Twitter rather than a blog, something I seem to be doing more this year – there are lots of trolls on Twitter so this is a useful cartoon to tweet every now and then. Below that is a Green Blob cartoon – which came from a story about ‘Friends of the Earth Limited’ being different from ‘Friends of the Earth’ so they could lie/spin/exaggerate as much as they liked to raise money. The fourth cartoon has helpful tips on what to do with Climate Scientists now the science is settled and we have the Paris Agreement. Where did the time go? It is now May and I have not looked at this website for months – it’s been that busy! I guess the first cartoon on the February page is entirely appropriate – ‘whatever’. The topic of Climate change seems to have dropped from main stream media. Below is a similar cartoon with David Cameron becoming a sceptic when he sees the massive costs. He is not new news too now. Below that is a cartoon about the Paris Agreement. The main cartoon is Climate Change the Musical – Obama (old news) stars in an expensive show. Apparently 20-whatever was The Hottest Year Evah! Or not. You never really know with Climate Science. But at least the science is settled so we can sack all the climate scientists. And Tuvalu– who knew science required evidence? The main cartoon at the bottom is the thought that the toothless Paris Agreement on Climate Change was ‘Legally Binding’ isn’t and probably not understood by anyone anyway. Good job. Top left the hilarious Boaty McBoatface story. To the right another in the Paris series of cartoons. Below, a memo to Monbiot on subsidies. To the left of that a story about the confusion Climate scientists have on knowing which is the Northern hemisphere or the other one – direct link here. Finally ‘Come to University!’. As I write we are not quite there but I might as well get ahead of myself. Especially as the big cartoon is on EU referendum shenanigans – something we have seen a lot of since the UK voted for Brexit. Emmanure Thompson makes an appearance – great make-up. And finally we try to save our steel. The Planet is Greening – we told you so! Next is how to frame Climate change. I use the word ‘Frame’ advisedly, m’lud. Bottom right came from a post by Steve MacIntyre about Gavin Schmidt trying to hide the gap. Bottom left, Brandon discovers a Climate Stupid Chart. Look, it’s a real thing. At the end of August I went on a trip to East Africa for a month. It was a lot of fun but it does mean I have been trying to catch up with work ever since – this page has been the most neglected! My apologies. The good thing is that it would not take much sleuthing to see that most of the cartoons are about the two books Lynsey Ward and I published last year: Subsidy Sam and Tiny the Turbine. The other cartoon, top right, is about the Green Blob feeling the sharp stab of economic reality and the burn of bankruptcy. Brian Cox, celebrity physicist, reaches Absolute Zero throwing of graphs in a debate with the now the then Senator Malcolm Roberts. Three cartoons are about Nicholas Stern using other people’s research to get funding, lots to read here, here and here. Bob Ward features, of course. Michael Mann brought out a book this year called ‘The Madhouse Effect’. And lastly the Green blob wants to know where his money while James Hansen calls the Paris Agreement talks “a fraud”. Blackouts in Australia due to Wind energy. Leo DiCaprio flies around the world telling people not to fly round the world. Hmm. The bottom left cartoon is about the US Presidential election – I am not sure many of us knew quite what was going on. And then… Trumped! How did that happen? I draw quite a few cartoon notes at talks I go to. Two are here: Clexit, a talk about leaving the world’s biggest climate scam behind, and the GWPF annual lecture by Matt Ridley. There is a cartoon commissioned for an article about William of Ockham and how he might view the infamous ‘hockey stick’. Another tweeted cartoon with Ed Hawkins on ‘Wadhams Lite’, about how alarmists like to tone down Peter Wadham’s extra alarming alarmism. Finally a happy earth, more CO2, more greenery, more life – just what you need at the year’s end. Now you can order a 2018 Calendar!